I have spent a considerable part of my life living and traveling outdoors and learning and perfecting wilderness survival skills. My experiences include thousands of miles of solo long-distance sea kayaking journeys both in the U.S. and abroad, as well as wilderness canoe-tripping and backpacking in environments ranging from Central American jungles to the wilds of Alaska and Canada. 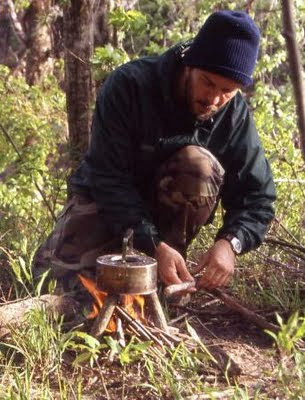 I have applied the principles put forth in this blog during the course of many experiments in survival living in which I've tested my skills in the swamps of the Deep South, the biggest wilderness areas of the Rockies, and the desert and canyon country of the Southwest, and on uninhabited islands in the Bahamas and the Caribbean. I have been writing about my sea kayaking and sailing adventures for more than twenty years, and I wrote four previous books related those subjects. Bug-Out: The Complete Plan for Escaping a Catastrophic Disaster Before It's Too Late, published in June, 2010, was my first book on the subject of survival, followed by Getting Out Alive: 13 Deadly Scenarios and How Others Survived, (March, 2011) and Bug Out Vehicles and Shelters: Build and Outfit Your Lifesaving Escape, (October, 2011). Books in progress include a work of Apocalyptic fiction and an additional non-fiction survival title. Updates on these and other projects, reviews of my published books and other news can be found on my Facebook Page.